Well, I have to tell you that I love some of those “no-no” mystery writing rules. I’ve employed a few of them and felt darn good about doing so. In fact, one of those you posted is going to end up in Murder Visits Antigua. What the hey! It is a Golden Age mystery. FYI, I linked over from a posting at the GA forum group. So you have a growing audience, it seems. Yes, it’s not really about following the rules — everything old becomes new again somewhere down the road. It’s all in the presentation, right? 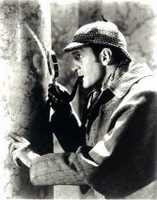 Sherlock Holmes in A Study in Scarlet. I wonder how many of the plots in those Golden Age Detective stories are rehashed in a modern setting by crime writers. But there is probably a 60 year statute of limitations on plagiarism. There’s a reason they call it the Golden Age. Those plots — like the classic locked-room mystery — are just fun,in all their infinite variations. Next up for me: an attempt at the dummy-figure alibi! http://www.detectivesbeyondborders.blogspot.com/here each rule is broken. I was unaware of that list, and I can’t get the link to go anywhere — but the Skvorecky book sounds fun. Is it hard to spot the broken “rules”? I don’t remember if I committed the rules to memory before I read the stories. In some, I failed to spot the breach. In at least one case, I found it. But the stories are fun regardless. They feature the characters from Skvorecky’s stories about Lt. Boruvka, which are worth reading.